Two thumbs up, four stars, a 10, you name it. The worst part about John Belushi is Dead is that I cannot give it a strong enough endorsement. Let me give you some examples of how Hilda and her best friend Benji navigate L.A. They eat at the restaurant where Janis Joplin had her last meal Benji pays a guard for bricks from the Ambassador Hotel while it is being demolished (where Robert Kennedy was assassinated) they visit the former apartment of silent film star Bernie Bernall, where he committed suicide by stabbing himself (or did his girlfriend do it?) they drive to Cielo Drive to take pictures of the site of the Tate murders (although the home has been demolished and rebuilt) and so on. And so on. There’s more to Hilda than morbid curiosity — she lives with her aunt and struggles with issues of death (it’s been five years since her parents died in a car accident), she observes Benji delving dangerously deeper into their hobby than she likes, and she strikes up an unlikely friendship with the tenant in the Bernie Bernall apartment, who, coincidentally, reaches out with a major token — a tile from Jayne Mansfield’s pool. When I received this book, I skimmed through it to get an idea of what I was in for. I immediately started reading and could not — I repeat, could not — put it down. I read this book in one night. 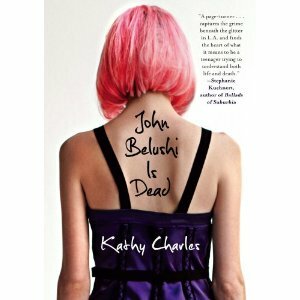 John Belushi is Dead was, ironically, a breath of fresh air. It was fun, funny, and fantastically well-written. This will be one of those books that remains on my bookshelf, and gets read again. And again.